The School of Medicine has announced the recipients of the October 2013 Sarah Morrision Student Research Awards. 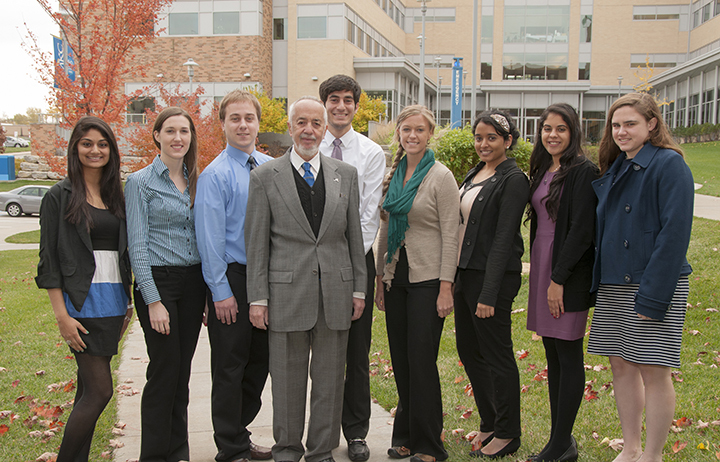 The School of Medicine’s Office of Research Administration announced nine students have been selected to receive the October 2013 Sarah Morrison Students Research Award. The research awards are presented twice a year. Kaitlin Vogt, MS 5 / Carol Stanford, M.D., associate professor of medicine and Gold 5 docent. The application deadline for the next round of Sarah Morrison Student Research Awards is April 1, 2014. Complete application information and the necessary application forms can be found online at http://www.med.umkc.edu/research/student_awards.shtml. Health care professionals understand that in the advancing world of genomics, knowledge is drawn from every patient encounter. 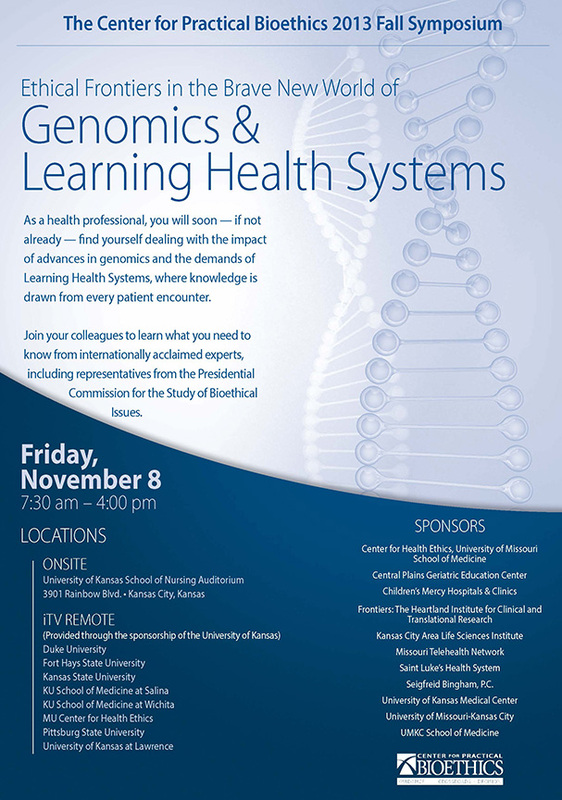 The School of Medicine will co-sponsor the one-day Center for Practical Bioethics 2013 Fall Symposium on Nov. 8 on the Ethical Frontiers in the Brave New World of Genomics and Learning Health Systems. The symposium will attempt to provide insights to issues on the ethical frontiers of genomics, research, clinical practice, policy and advocacy. Internationally-acclaimed experts, including representatives from the Presidential Commission for the Study of Bioethical Issues will lecture and lead panel discussions that explore topics from the science of human genome sequencing and it’s implications for privacy to the obligations of patients and providers to participate in research related to routine patient care. Continuing medical education credit is available. For web registration, go to www.practicalbioethics.org, or download a copy of the full brochure for more details. The University of Missouri-Kansas City is one of only five universities in the nation to receive a special federal grant designed to improve health care for groups of people stricken with illnesses at a higher rate than the general population. The National Institutes of Health grant will fund UMKC’s participation in the Urban Universities for HEALTH Learning Collaborative, an effort to address persistent health disparities between the poor in urban neighborhoods and the nation as a whole. At UMKC, the grant will fund research designed to measure how much those disparities can be reduced by greater diversity in the health care workforce, and improved diversity awareness in the training of health care workers. 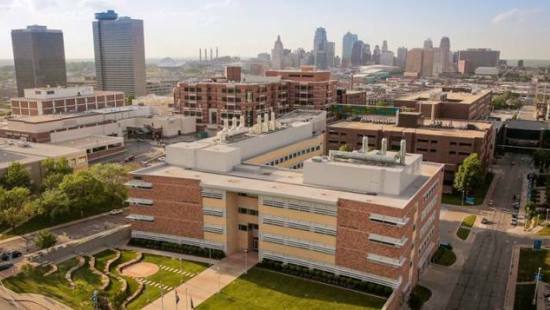 The grant was awarded jointly to the four health professions schools on the UMKC Hospital Hill campus: the School of Dentistry, School of Medicine, School of Nursing and School of Pharmacy. 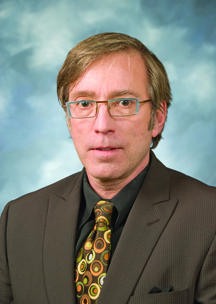 William Lafferty, M.D., professor and Merl and Muriel Hicklin Missouri Endowed Chair of Internal Medicine, is the principal investigator. He said both the collaboration and the proximity of the four schools played a role in UMKC winning the highly competitive grant. According to Lafferty, while the process for the UMKC study will involve increasing diversity in the health care workforce, the goal is to affect health care outcomes for people suffering from disparities. One contributing factor to the persistent disparities is that fewer health care professionals choose to work in the poorer urban core neighborhoods where disparities are common. A goal of the study will be to develop evidence-based educational practices that will result in more graduates willing to work in those areas after graduation. “We are looking to develop practices that will result in both a more diverse workforce, and a workforce more willing to work in areas that experience disparities,” Lafferty said. “We believe that a more diverse workforce will understand the life experiences of these populations in a more meaningful way. That is not to say that someone without that background wouldn’t or couldn’t become a terrific health care provider in those areas. We want to make sure that the education that we provide in our health professional schools produces graduates who will want to serve in those areas and will serve in those areas. “Ultimately, our goal is to identify the best model of education needed to reduce health disparities,” Lafferty said. Collectively, the four schools graduate about 500 health professionals each year. In 2011, at least 20 percent of those graduates were from underrepresented populations. The schools employ a holistic admissions review process that is race-neutral, and will continue to be during the study funded by the grant. The NIH grant for the project, worth $427,856 over four years, is administered through a joint effort between the Urban Serving Universities Coalition and the Association of American Medical Colleges. A key factor in winning the grant competition, according to Lafferty, was the commitment of high-ranking, highly qualified people from each of the four participating schools. In addition to Lafferty, the Urban Workforce Disparities Leadership Group includes Karen Williams, PhD, professor and chair of the Department of Biomedical and Health Informatics; Patricia Kelly, PhD, professor of nursing and associate dean for nursing research; Margaret Brommelsiek, PhD, assistant professor of medicine, instructor in the School of Nursing and director of inter-professional education; Linda Garavalia, PhD, professor of pharmacy and associate dean for academic affairs; Susan Wilson, PhD, associate dean for diversity and community partnerships in the School of Medicine; Carrie Hanson, RDH, MA, associate clinical professor of dentistry and director of the Admission Enhancement Program; and Chris VanNess, PhD, research assistant professor in the School of Dentistry.